She's better fed than meself! More information coming out today about enterprising Ellie in the Sunday Times - its behind a paywall. In a Hot Press interview she was an activist in Malawi 2008 -2011 then flees to the safety of Ireland. 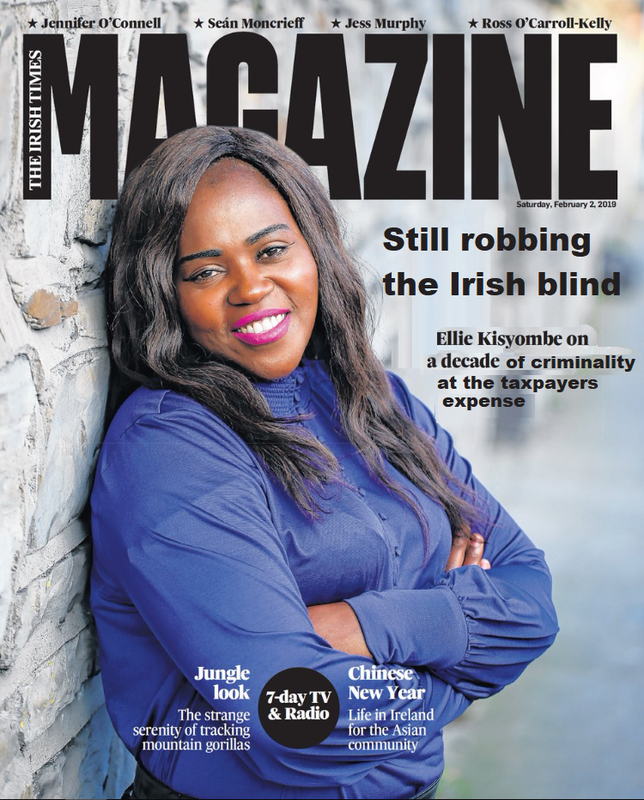 In the Irish Times Magazine (2.2.2019) she arrives in Ireland early 2010 but in a high court case she claimed to be living in the UK 2007 -2010 on a student visa. The Irish Times interview reveals she had an unplanned pregnancy resulting in twins at a young age. Interestingly Ellie's age has never been mentioned in any of the interviews I've seen. The Irish Times says she's spent nearly a quarter of her life in direct provision - that makes her around 35. The twins are approx 20 as the daughter is in her second year studying law here. The daughter came to Ireland 4-5 years ago, and the son 3 years ago according to Ellie. This rather contradicts her claims that she is a single mother who brought up her children in poverty. When she got pregnant (probably around age 15) she was sent away by her affluent family to finish her education and her family looked after the twins. They were eventually with an uncle and aunt close to the then President of Malawi. There is not mention that she ever cared for them after she returned from finishing her education. Now, if as she claims, that she was in such danger that she had to flee from Malawi, how could she have left her children behind? I suspect she wanted to have them in Ireland as anchor children - the daughter is now studying law at the taxpayers expenses and the son wants to study too. Imagine the pleas if Ireland tries to deport her asking for the twins to finish their third level education here. Very disappointing that the long piece in the Irish Times never raised the issue of her not raising her children, and then leaving them behind until they were almost reared. Ellie is a worthy successor to Pamela itsascam! Did any of you hear the Nigerian c##t who is running for FG on RTE R1 with Brendan O'Connor yesterday morning? In the judgment it appears she had a lesbian relationship behind the back of her partner and is citing homophobia as the reason for her being persecuted. Is this an additional reason she is being feted and gets a free pass from the media? She was also in the UK in 2011. She sounds like the ideal citizen for the new Repukelic of Liarland - victim of this victim of that and a bit of carpet munching thrown in on top. She could end up in the Aras if she keeps this up. The content of that judgment should be widely highlighted. She two timed her male partner and her entire career has been founded on that adulterous act. If we don't call foul on this candidate then as a nation we deserve everything we get. In my reading this morning for my post above, I noted she has also studied at the Ballymaloe Cookery School. No prizes for guessing who paid for that! She has admitted in interviews that if elected as a cllr she can't take the salary as she is not allowed to work. But what is the situation re the unvouched and untaxed 'expenses' councillors get of about 7K pa? It is rediculous that apparently her nomination can be accepted when she herself admits she cannot take the salary if elected. How did the Social Democrats let this one through? Folks, do any of ye know how many people are in Direct Provision? Were they and DP always going to be used as part of the propaganda war for open borders? It suits t.p.t.b. to have this system. It's similar to the homeless numbers.